Nepal second earthquake: 7.3 on Richter scale, many deaths reported. 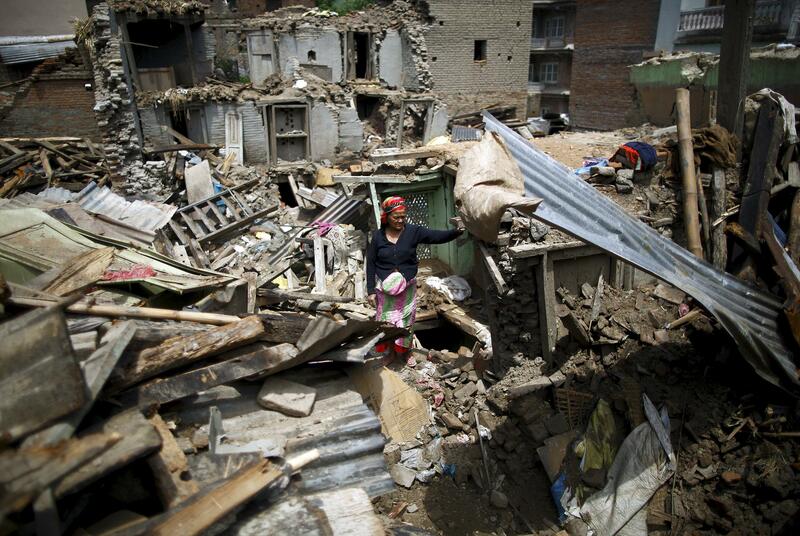 A woman stands amid rubble Tuesday in Sankhu, Nepal. Residents of Kathmandu, the capital, reported that buildings swayed in the earthquake, which was felt as far away as New Delhi. The United States Geological Survey assigned the quake a preliminary magnitude of 7.3, with an epicenter about 50 miles east of Kathmandu, near the border with China. The April 25 earthquake registered magnitude 7.8 and was centered west of Kathmandu. Tuesday’s quake was deeper, however, coming from a depth of 18.5 kilometers (11.5 miles) versus the earlier one at 15 kilometers (9.3 miles). Shallow earthquakes tend to cause more damage. Rescue workers and reporters described individuals running out of buildings toward open ground as the quake struck at around 12:30 p.m. local time and was followed by what Reuters describes as “at least half a dozen” aftershocks. Many residents across the country—fearful of exposing themselves to further shocks inside buildings that may already have been made structurally unsound in previous days—will now be forced to sleep outdoors, just as they did after the first quake on April 25.